Now Archived! PolarConnect event with Lee Teevan and Mary Beth Decker from the R/V Oceanus out of Dutch Harbor, Alaska on 3 August 2017. You can access this and other events on the PolarConnect Archives site. 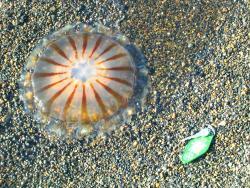 A jellyfish on the beach near Barrow, Alaska. Photo by Misty Nikula-Ohlsen. There is public perception that jellyfish populations are increasing on a global scale. While this may be true for some areas, in the eastern Bering Sea, jellyfish populations have fluctuated dramatically during the past three decades. This project will estimate the age structure and age-specific abundances of the predominant jellyfish in the Bering Sea, Chrysaora melanaster, in order to understand how their population size changes with time. The ultimate goal is to estimate the reproductive capacity and success of this jellyfish in relation to climate variability and to investigate the potential for jellyfish population increases to become a recurring pattern in the Bering Sea under future climate scenarios. In the Bering Sea ecosystem, key questions are whether increases in jellyfish abundance are a recurring phenomenon under climate change and fishing pressure and how these population increases affect ecosystem structure. The R/V Oceanus. The team will conduct their work aloard the R/V Oceanus in the southeastern Bering Sea. Teacher Lee Teevan and researcher Mary Beth Decker discuss the science and research behind their expedition aboard the R/V Oceanus looking at jellyfish in the Bering Sea. Growing up in a small town in Ohio, Lenore Teevan biked all over the countryside and wandered the creeks and forests there. Her love of nature and travel has led her to explore places as far as West Africa, as a Peace Corps volunteer, and Japan, as an English teacher. Currently, Ms. Teevan teaches Earth Science and Oceanography at Booker T. Washington High School in Norfolk, Virginia. In addition, she samples water from the Chesapeake Bay as a member of NOAA’s Phytoplankton Monitoring Network. Being able to actively engage in relevant scientific research and inquiry is what motivated her to apply to PolarTREC. Ms. Teevan is looking forward to participating in Arctic research so that she can share a deeper understanding of scientific inquiry with her high school students. She hopes that her firsthand accounts will allow others to view what is involved in ongoing research at sea. She envisions lighting a spark to inspire and motivate her students to pursue university studies and careers in science. Outside of the classroom, Ms. Teevan trains in karate and jiu-jitsu and cycles whenever she can. Thanks, Rebecca! I enjoyed hearing about your experiences too! webinar and looks like a great trip!